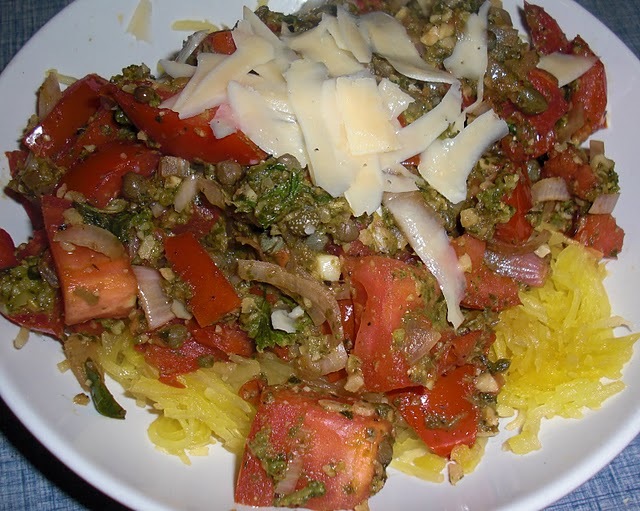 This time of year I am absolutely crazy about spaghetti squash. These large, yellow oval squashes should be popping up in your CSAs and on your supermarket shelves. They are delicious, healthy, and provide easy-to-cook vegetable noodles that you can substitute in all of your favorite pasta recipes. In the above photo I topped my “noodles” with a sauce made from the last fresh tomatoes of the season, pesto, capers, and of course, a healthy dose of parmesan cheese. Not all squash will come with their own instruction sheets, so if you’re not sure how to cook spaghetti squash, never fear. 1. Cut the squash into manageable chunks. This may just be halves for a small squash, or quarters for a larger squash. 2. Carefully scoop out the seeds, leaving the flesh. You can wash the seeds and place them on a greased cookie sheet and roast them in the oven, if you like! 3. Place the squash, cut side down, in a large casserole dish/es, cut side down. Add water to dish until it covers the bottom half inch to inch of the squash. 4. Microwave on HI until the squash is soft. For two smallish squash halves, this will take about 8 minutes. OR you can roast the squash in the oven, much like you would acorn or butternut squash. This method works fine, but will take much longer. 5. Remove the squash sections from the casserole and allow them to cool slightly. 6. Using a fork, “rake” the squash flesh away from its outer shell. It will pull off in strings, like spaghetti noodles. I LOVE spaghetti squash, but I never considered cooking it this way. Great tips. Thanks! I just made spaghetti squash today, yum! Just made some spaghetti squash with a light mushroom garlic squash! This type of squash really fascinates me. It’s crazy how it just so easily peels into noodle-shaped strings.